BIBLICAL—that is how David Cameron described the floods spreading misery through southern England. Thousands of hectares of farmland have been under water for weeks and over 5,000 houses abandoned. Local railways are damaged and their services in chaos. Soldiers have been deployed to leafy Thames-side suburbs, where looters were rumoured to be splashing through abandoned stckbrokers' palaces. yet his recourse to scripture also invited the uncomfortable question of who, exactly, is to blame. The question matters to Mr Cameron. His reputation for competence underpins his party's electoral chances. He may be able to brush off the councillor from the UK Independence Party who saw the floods as divine retribution for the prime minister's successful campaign to legalise gay marriage. 73% of Britons support a Daily Mail campaign to divert money to flood victims from Mr Cameron's unloved foreign-aid budget. There is even an echo of the opprobrium thrown at George Bush for his useless response to Hurricane Katrina. Some of these recriminations are justified. In 2009 the Environment Agency, which is charged with keeping water in its proper place,requested an annual increase in spending on flood defences. This was not unreasonable: more people are living in flood-prone areas, and global warming is likely to lead to more extreme weather. The agency's budget for capital expenditure has instead been cut by 28%. The extra cash now promised must be spent on repairing damaged defences, not investing in new ones. It was a failure characteristic of a government that has too often sacrificed long-term spending on infrastructure to the exigencies of short-term belt-tightening. The government's initial response to the disaster was also poor. Mr Cameron implied the flooding on the Somerset Levels, an area of land below sea-level, had been exacerbated by a decision to stop dredging the man-made rivers that drain it. That suggested the last, Labour, government was to blame. Yet dredging would at best have mitigated the flooding only a bit. The Environment Agency is right to give low priority to protecting farmland. Towns are more valuable. Torn between conflicting desires to appear in control of the calamity and blameless for the suffering, other ministers blathered. Eric Pickles, the communities secretary, sniped at the Environment Agency—which is led, not coincidentally, by Lord Smith, a Labour Party grandee. the European Union, on the basis of one directive or other, and the Liberal Democrats, their main rival in the south-west. For a government that takes pride in its efficiency, this was a shambles—and one seized on not just by Labour but by Mr Cameron's many enemies in the press and his own party. How much this will hurt Mr Cameron electorally is unclear: most of the flooded areas are safe Tory seats. But the scale of the opprobrium is wildly unfair. That is partly because Mr Cameron has got his act together, promising the acceleration of insurance payouts, giving affected companies more time to meet tax obligations and stopping the ministerial blather. But the bigger reason is simple: in this instance virtually all the blame should fall not on the government but on that other British bugbear, the weather. Recent weeks have been the wettest in a century. A giant storm surge and some of the biggest waves on record have contributed to a triple whammy of flash floods, waterlogging and burst riverbanks. Even if Mr Cameron had the wisdom of Solomon and the wealth of Croesus, he could not have prevented the flooding. 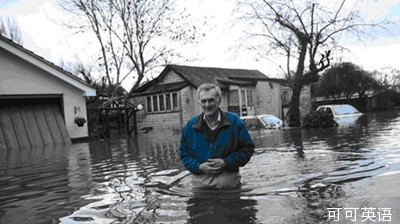 With climate science indicating that future inundations are more likely, Britons will therefore have to assume more responsibility for their own property. Anyone tempted to build or buy a house on a flood-plain or low-lying sea front should think again. And on this subject, at least, they should stop blaming Mr Cameron. Emerging economies were partly to blame for america's housing and credit bubble. Cigarette smoking may be to blame for one in five cardiovascular disease deaths. So we're going home to deploy to dubai. This option creates a special output that you can deploy to a production server. Brush off the screaming headlines, and your mood will lift. He gives her the brush off when he's tired. Traffic was ordered to divert to another road because of the repair of the main road. Prevent an enterprise to squeeze the step that takes divert to buy fund.